As you probably remember from my post about spaghetti squash bolognese earlier this fall, I’m all about making home-cooked dishes that taste indulgent without the guilt. This time of year especially has us all wanting to eat comfort foot. But when it comes to fitting into those holiday party dresses, you’ll thank yourself later for finding a way to cook delicious meals that are light and healthy too. 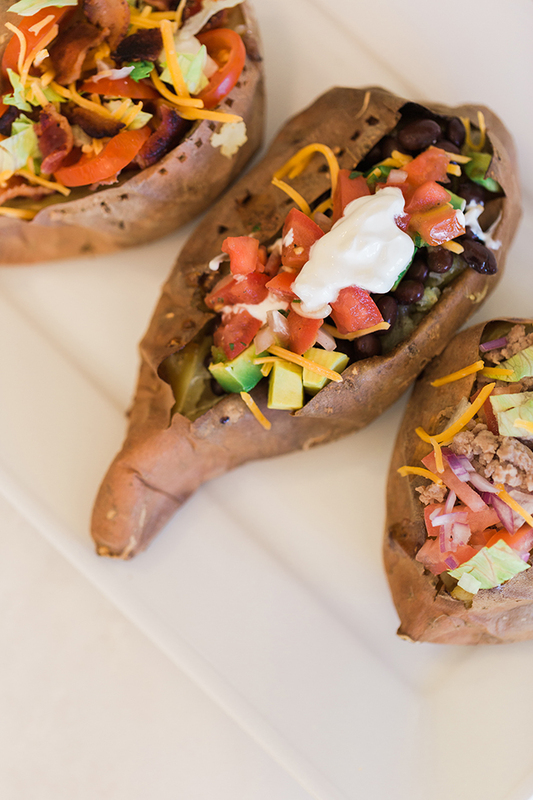 And today’s stuffed sweet potato recipes are exactly that! 1. Preheat your oven to 400 degrees. Using a fork or knife, poke a few holes into your sweet potato while it cooks to allow the steam to escape. 2. Place directly on the oven rack to bake for 45 minutes to an hour. 3. While your sweet potato is baking, make your turkey bacon on the stovetop (If you’ve never made bacon before, it’s easy! Simply take it out of the package, place it directly on a saucepan, and heat to a medium heat until fully cooked. Then place on a paper towel to cool.) You can also be shredded your lettuce and cutting your cherry tomatoes while your potato bakes. 4. Once ready, take your potato out of the oven and let cool for about 10 minutes. 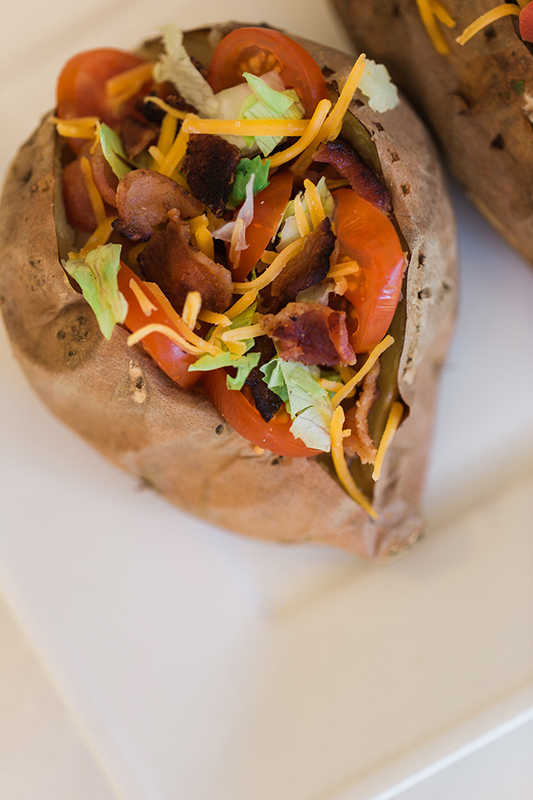 Slice the center of the potato open, then fill with your turkey bacon, lettuce, tomato and cheese and enjoy! Note: I like to eat mine just like this but if you need a little extra something, a light drizzle of vegan ranch dressing goes well on top. 3. While your potato is baking, you can dice your avocado and get your toppings ready for filling! 4. Once your potato is ready, take it out of the oven and let cool for about 10 minutes. 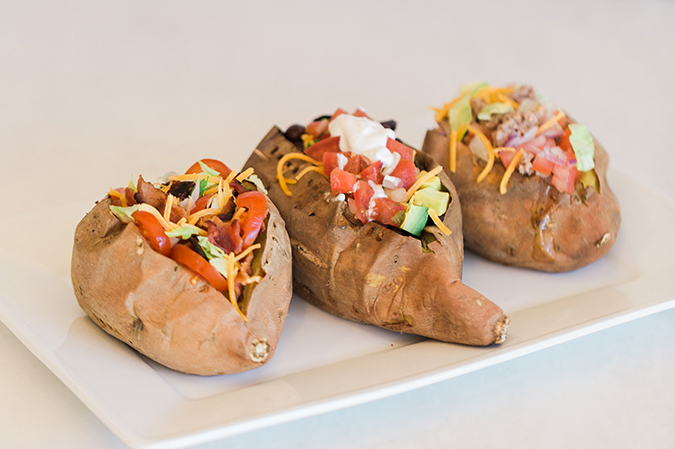 Slice the center of the potato open and fill with toppings, starting with your chipotle cream sauce, then black beans, avocado, salsa, sour cream and cheese. 3. While your potato is cooking, prepare your ground turkey on the stovetop. Simply place the ground turkey on a saucepan and warm on medium heat, cooking until brown (there will be extra leftover, so you can save and store it for another night). Shred your lettuce and dice your tomato and onion. 4. Once your potato is ready, take it out of the oven and let cool for about 10 minutes. Slice the center of the potato open and fill with ground turkey, lettuce, onion, tomato and top with cheese. Think of this one as a turkey burger stuffed into a sweet potato! The best thing about these three potatoes is that they are similar, but each has it’s own burst of flavor. I like to buy the ingredients for all three since so many are overlapping, and alternate which one I make each night. But the toppings are up to you—the options are endless. 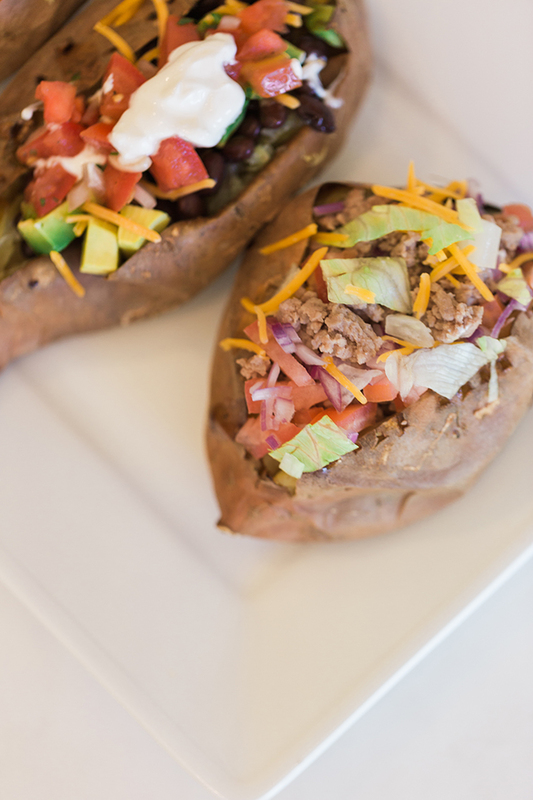 How will you spruce up your stuffed sweet potato? Do you have a go-to healthy dish to make on weeknights? Let me know your favorite recipes in the comments—I’d love to read all about them!